Soldiers Prayer Book, Protestant Episcopal Book Society, 1861. “Soldiers’ Pocket Book,” Presbyterian Board of Publications, 1861. 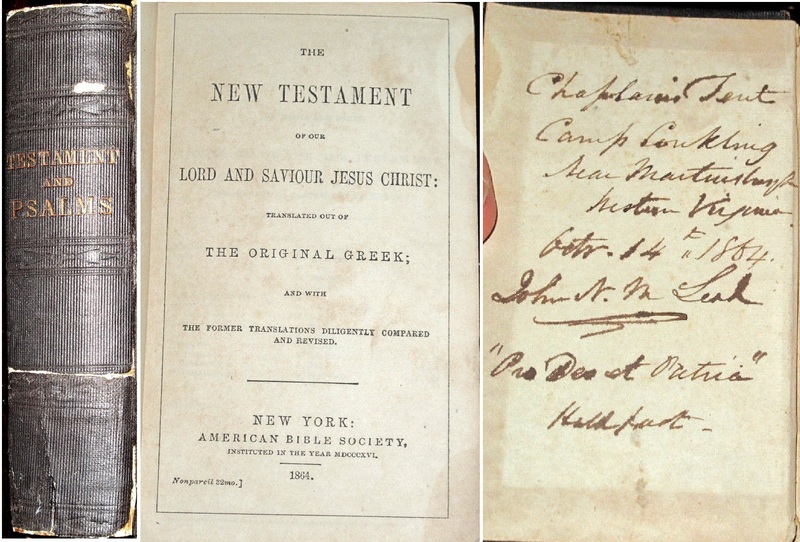 New Testament published in 1862 by American Bible Society. Given to Civil War Soldiers by the New York Bible Society (author’s collection). 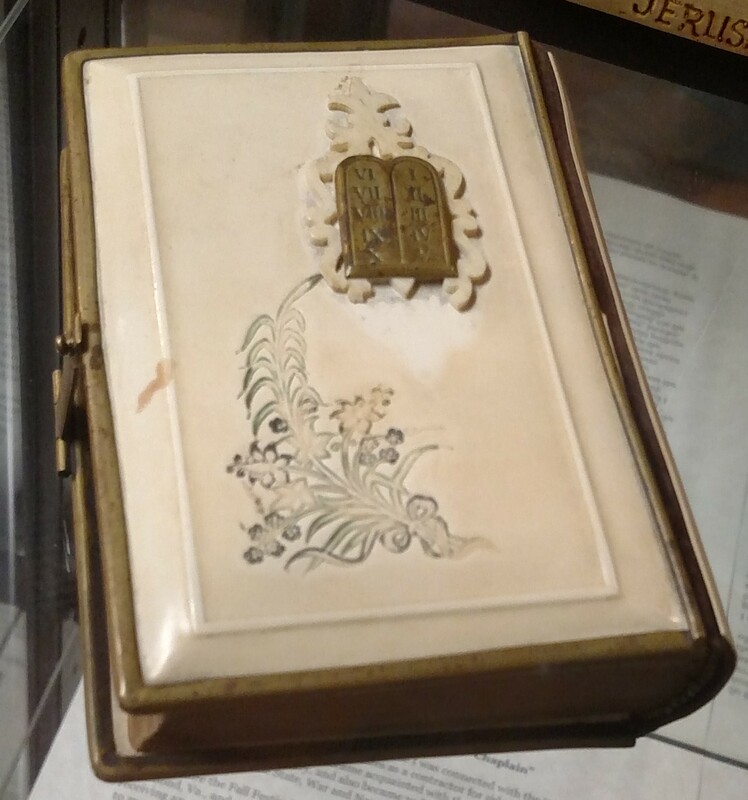 “This very rare Hebrew Prayer Book was purportedly owned by Corporal William Malkin of the 13th Connecticut Infantry.” Published by Joseph Guns of Vienna Austria. On display at the National Civil War Chaplains Museum. Interesting Civil War Bible recently up for auction: Published in 1864 by the American Bible Society. Signed by a chaplain with the comment, “Pro Deo et Patria” which later became the U.S. Army Chaplain Corps motto. 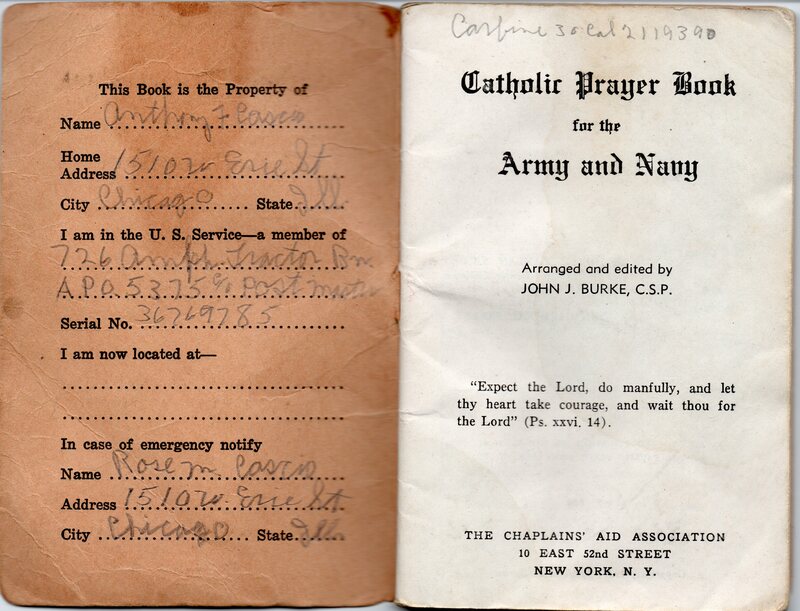 Catholic Prayer Book for the Army and Navy. Printed and published in the U.S.A. by The Paulist Press, New York, N.Y. Copyright 1917 by John J. Burke (author’s collection). Inside of Catholic Prayer Book, 1917 by Burke. Property of Soldier in the 726th Amphibious Tractor Battalion (author’s collection). 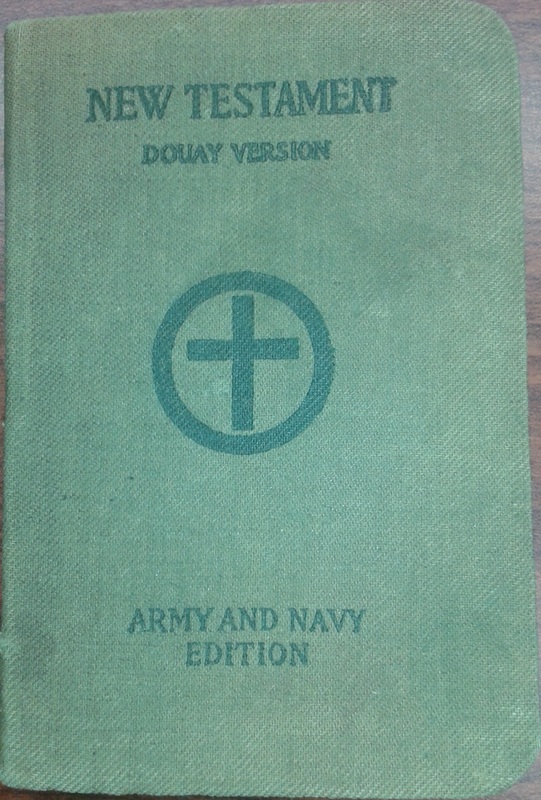 New Testament, Douay Version, Army and Navy Edition. 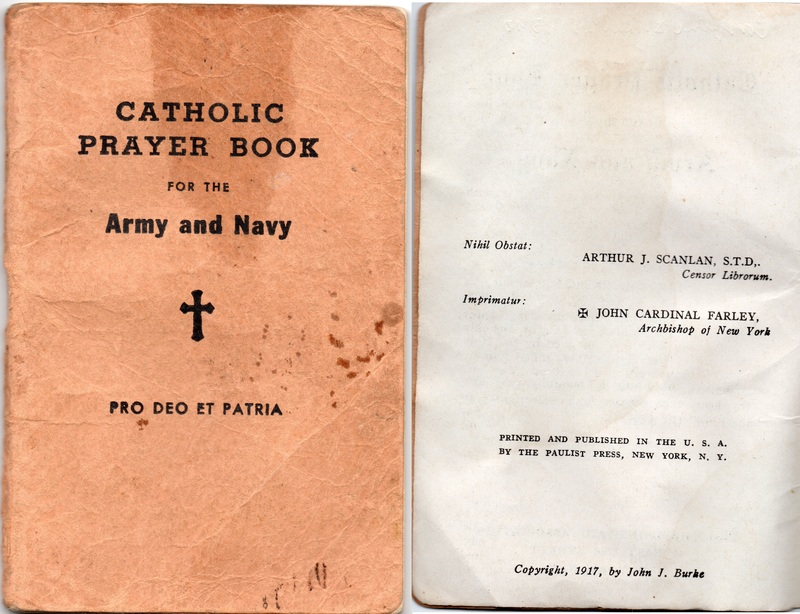 “Special Edition for the Army and Navy with a Foreward by His Eminence James Cardinal Gibbons.” Published by The National Catholic War Council for The Chaplains’ Aid Association, 1918 (author’s collection). 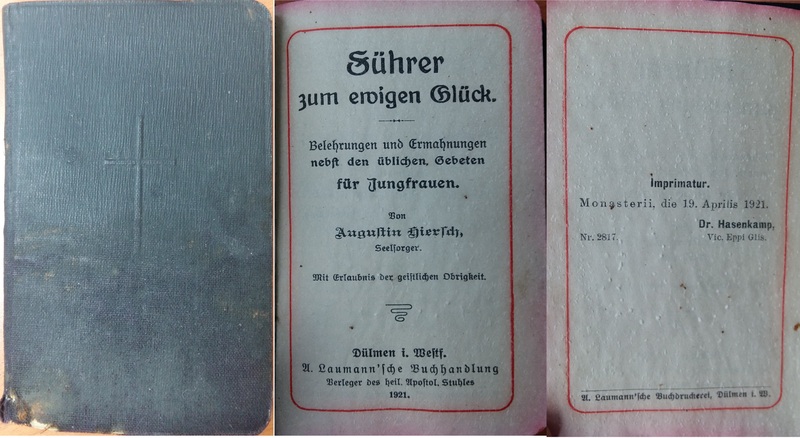 “Führer zum ewigen Glück” (Guide to Eternal Happiness), 1921. Said by his family to have been carried by a Wehrmacht chaplain at the Russian Front during WW2 (author’s collection). 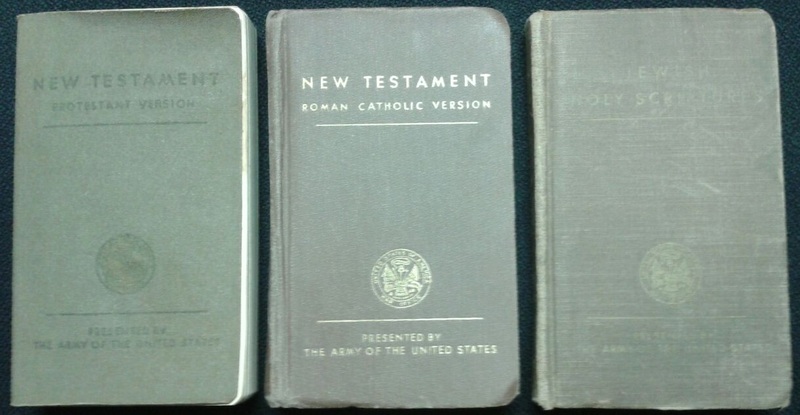 New Testament, Protestant & Catholic and Jewish Scriptures, 1942. (Author’s collection). 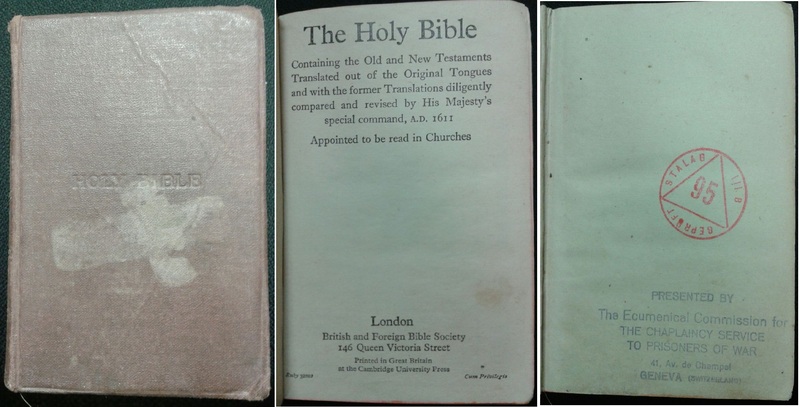 WW2 New Testament with metal cover with “May the Lord Be With You” embossed on it. Apparently given to Seaman 2nd Class Richard M. Chernich by Chaplain J. F. Moore of the U.S.S. Baxter (author’s collection). Chaplain Moore was a Presbyterian (USA) chaplain who attend the Navy Chaplain School, Class 12-43, the Summer of 1943. 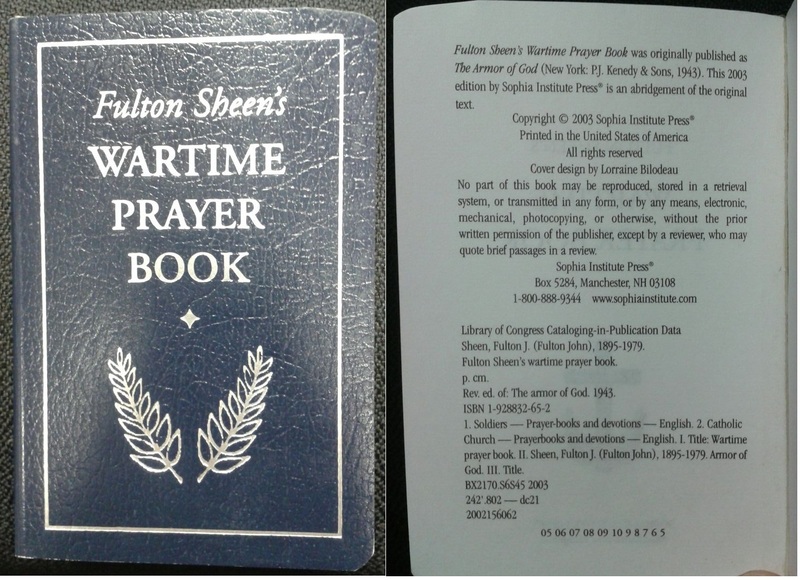 A Prayer Book for Soldiers and Sailors. 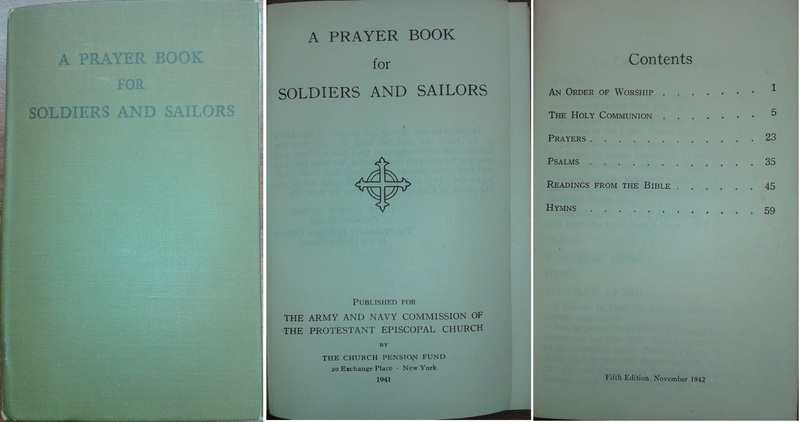 Published for The Army and Navy Commission of The Protestant Episcopal Church by The Church Pension Fund, 1941, 5th ed., 1942 (author’s collection). “Your Church Speaks,” published for the The Methodist Commission for Chaplains by The Methodist Publishing House, 1942 (author’s collection). 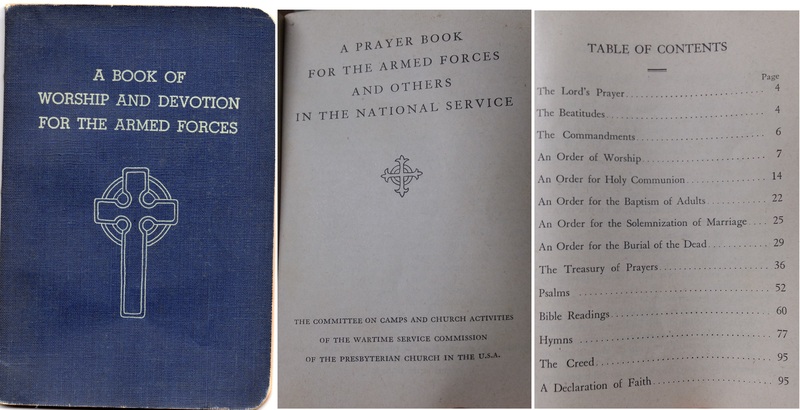 “A Book of Worship and Devotion for the Armed Forces,” The committee on Camps and Church Activities of the Wartime Service Commission of the Presbyterian Church in the U.S.A., 1943 (author’s collection). 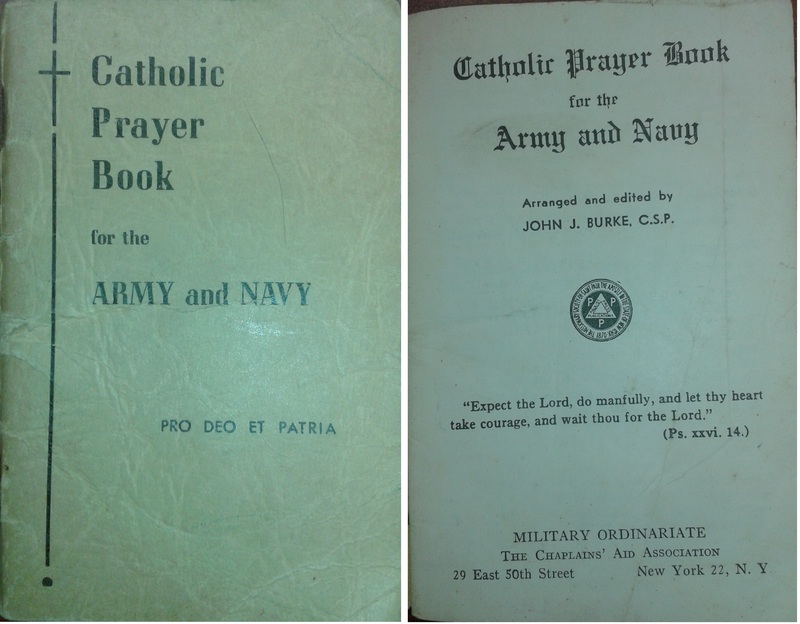 Catholic Prayer Book for the Army and Navy. 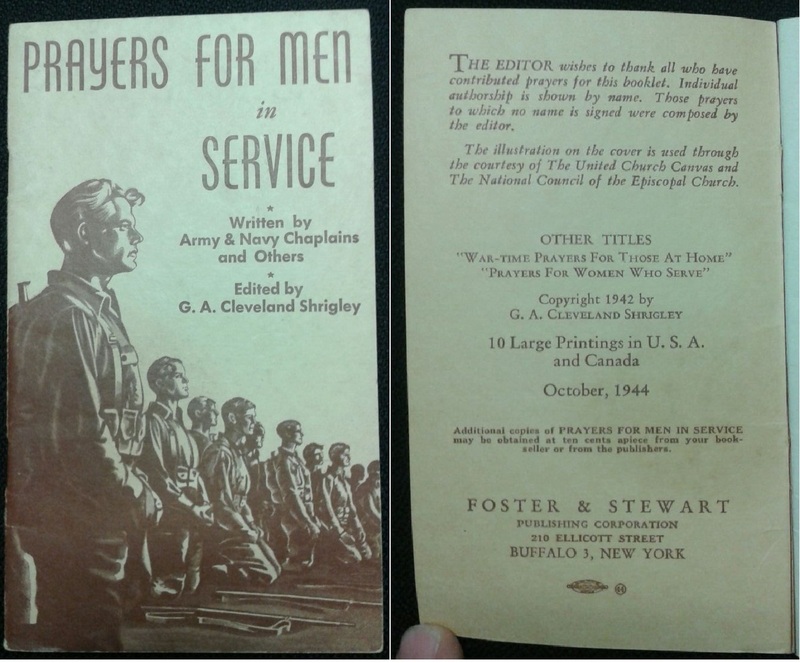 Arranged and edited by John J. Burke, C.S.P., Military Ordinariate, The Chaplains’ Aid Association, date unknown but assume WW2 era (author’s collection). “Service for the Armed Forces,” April, May, June 1943. Published for The Methodist Commission on Chaplains, Washington, D.C. (author’s collection). 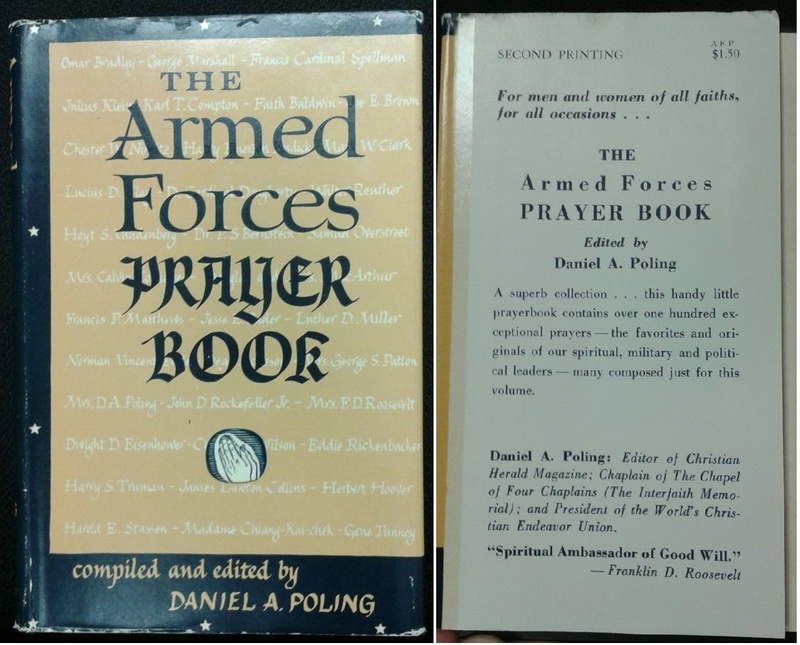 “Soldiers’ and Sailors’ Prayer Book” compiled by Chaplain Gerald Mygatt and Chaplain Henry Darlington, Alfred A. Knopf, 1944 (author’s collection). New Testament, RSV, A J. Holman Co., with seal of the U.S. on front. Copyright 1946 but handwritten date of April ’85 next to stamped name and address of Eugene Kaplan (author’s collection). 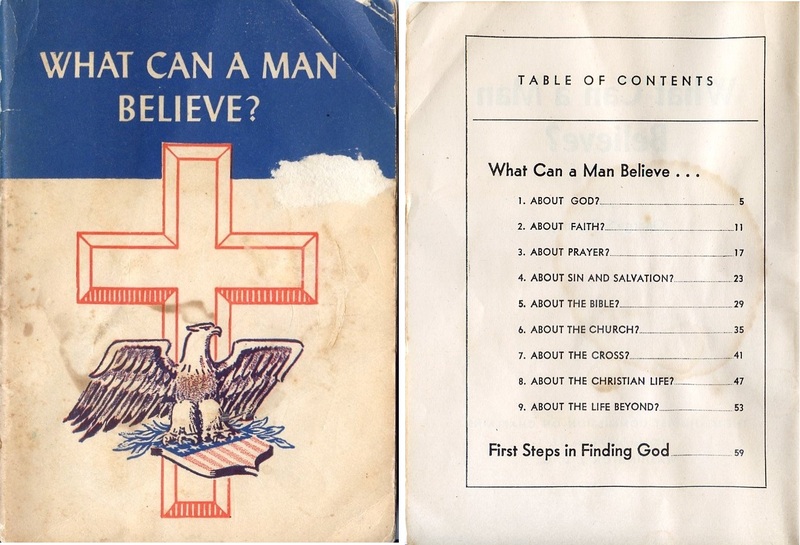 “What Can a Man Believe?” by George S. Reamey. 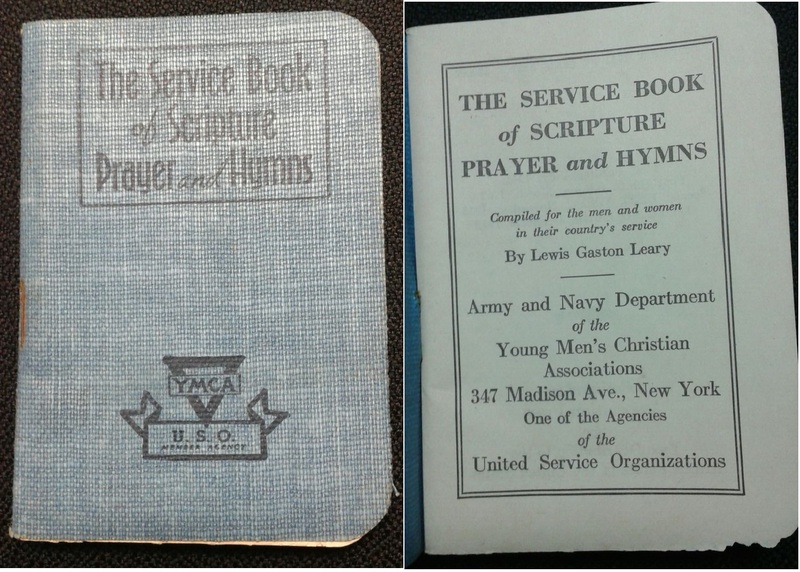 Published by The Methodist Commission on Chaplains, Washington, D.C., 1950 (author’s collection). “Armed Forces Service Book,” C.M. Jacobs & P.Z. Strodach, Muhlenberg Press, 1951 (author’s collection). 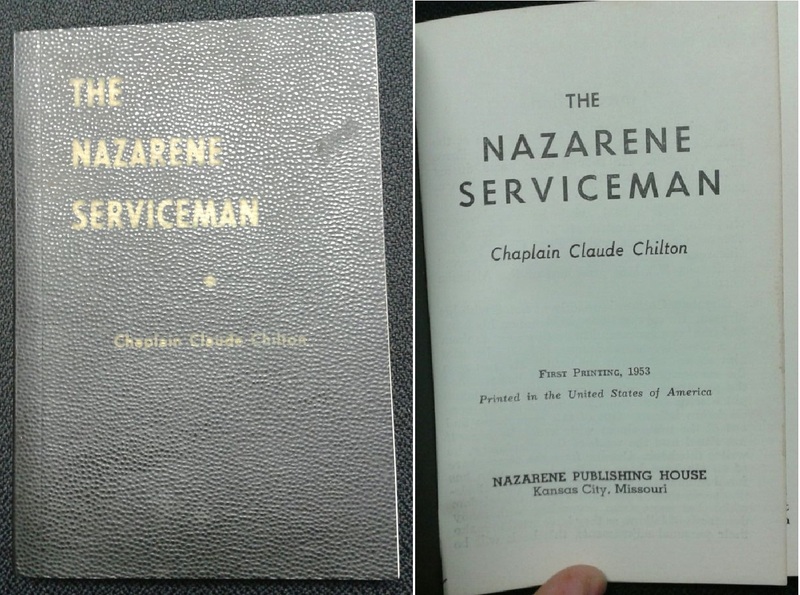 The Nazarene Serviceman, 1953, by Chaplain (MAJ) Claude Chilton who served four years during WW2 in the India-Burma theater. (Author’s collection). 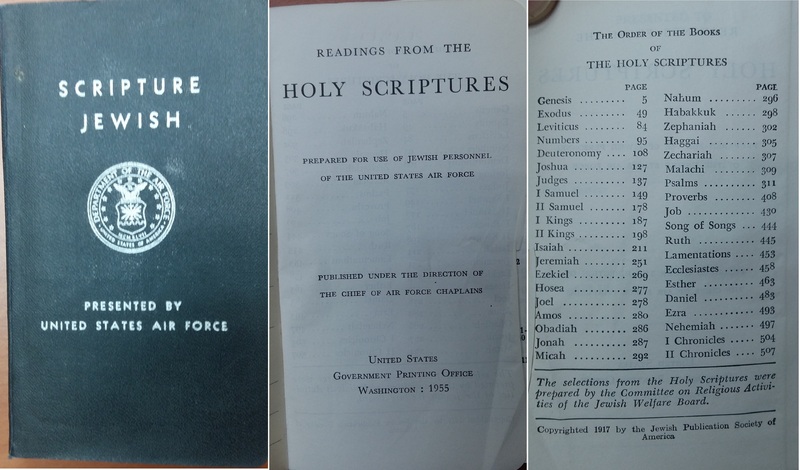 Jewish Scriptures, Air Force Chief of Chaplains, GPO 1955, originally published in 1917 by the Jewish Publication Society of America (author’s collection). “My Sunday Missal” with Department of the Navy insignia on front cover. Circa 1957 (1st date on calendar is 1958). Stamped on inside cover: “Office of the Catholic Chaplain, U.S. Naval Receiving Station, Naval Base Philadelphia 12, PA” (author’s collection). 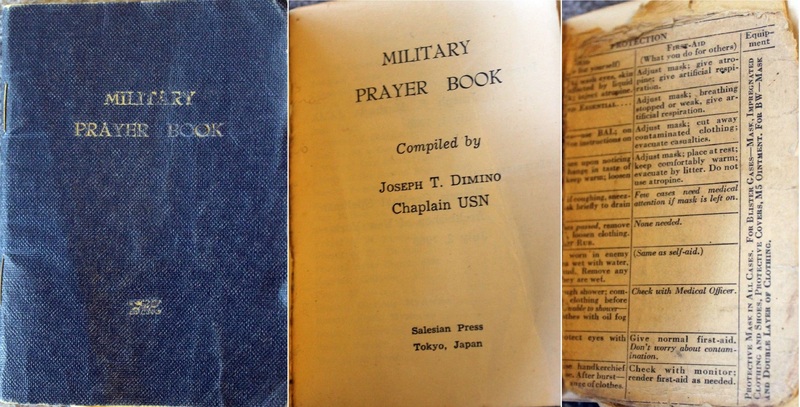 “Military Prayer Book” by Chaplain Joseph T. Dimino, USN, Salesian Press, Tokyo, 1960. 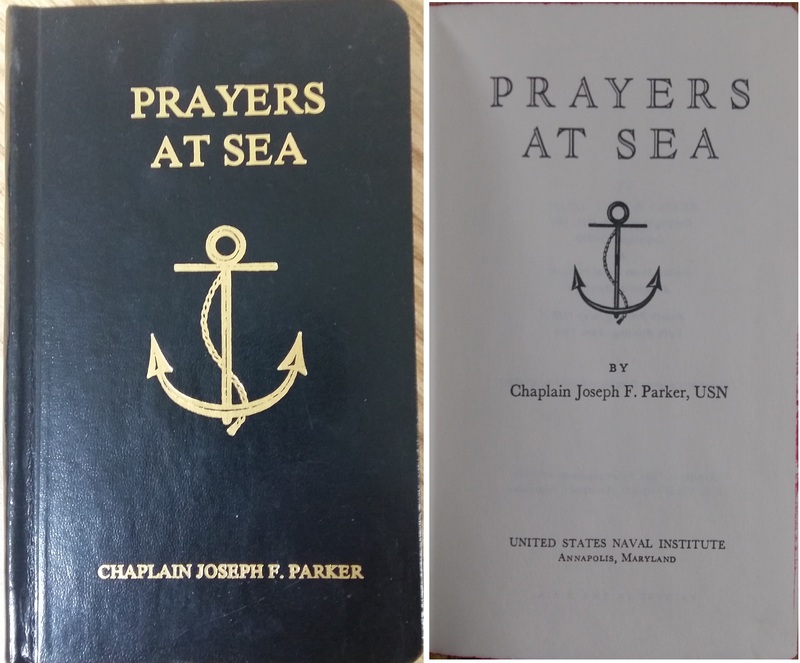 “Prayers at Sea” by Chaplain Joseph F. Parker. Copyright 1956, 1957, 1961, 1962 by U.S. Naval Institute, Annapolis Maryland, 4th printing, May 1962. 5th printing, April 1966. Reprinted 1984 by arrangement with the U.S. Naval Institute, Annapolis, Maryland (author’s collection). 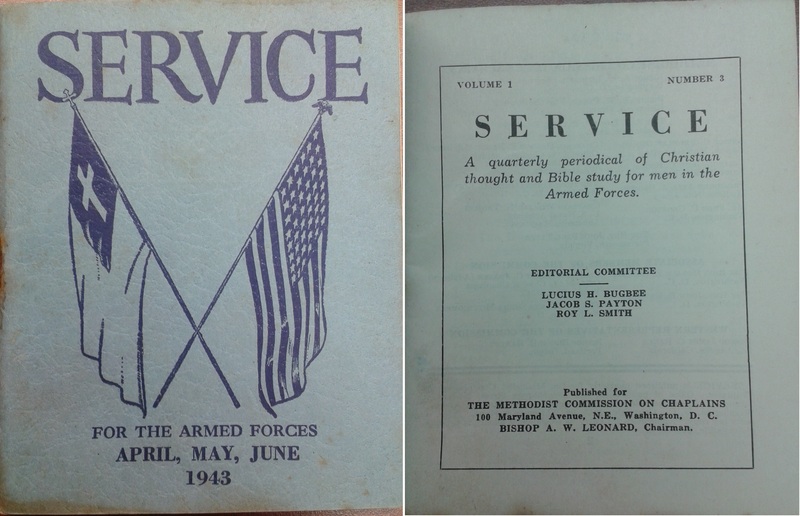 U.S. Armed Forces Edition, The New Testament, King James Version, produced for U.S. Service Members by the First Baptist Church in Milford, Ohio (author’s collection).